Before I entered the Microsoft Lounge in Venice, CA last night, the guy at the front instructed, “Put your phones on airplane mode and hand them to me.” A little confused, I did what I was told and forked over my phone to be locked away into a hefty pouch. “Come back after the presentation, and we’ll open it up for you,” he said with a smile and turned to the next set of willing attendees behind me. “What is this? Fort Knox?” I joked as I walked inside the building, realizing that I wouldn’t be able to document the event on social media. Little did I know, this was all part of the experience. The Microsoft Lounge is certainly more glamorous than Fort Knox. Featuring a festive patio with a bar, a sleek kitchen serving warm hors d’oeuvres, and high exposed wooden beams, the site was the perfect place to host an intimate gathering to celebrate Childish Gambino’s latest musical venture PHAROS. Donald Glover—the man behind the stage name—teamed up with Microsoft x Technology to give his audiences a unique live experience this past Labor Day weekend. Glover invited fans to Joshua Tree, CA for a three-day concert event inside an enormous dome tent. 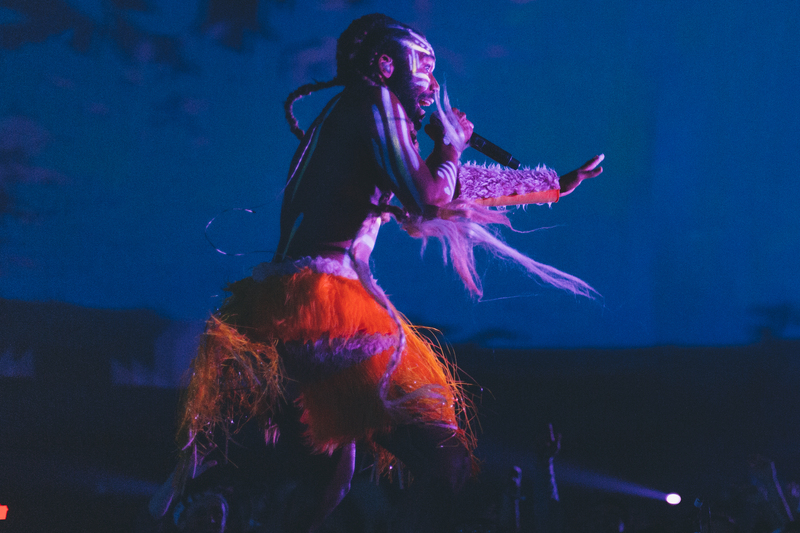 Dressed in glow-in-the-dark tribal paint, he performed his newest album “Awaken, My Love!” for the first time with high-sensory audio-visual projections surrounding the stage. The event was filmed using 360-degree technology and subsequently turned into a VR experience for fans to enjoy long after the live event ended. In order to keep the new album a secret before its official release, guests were asked to lock their phones inside pouches, much like the one containing my own phone. Glover was joined onstage by Wolf + Rothstein’s Chad Taylor and Fam Udeorji, as well as Microsoft’s Amy Sorokas (Director of Strategic Brand Partnerships, Brand Studio) and Fred Warren (Creative Director). Each praised Glover’s commitment to innovation and for tackling the financial and technological challenges of such a large-scale production like PHAROS. The last question asked by the moderator probed further into Glover’s passion for new artistic pursuits, as evidenced by his critically-acclaimed TV show Atlanta, on which he plays a number of roles including creator, writer, director, and lead talent. After the presentation, we watched a short behind-the-scenes promo of PHAROS before experiencing the concert for ourselves at a VR station. With pulsating instrumentals, mesmerizing visuals, and Glover’s electric performance, the VR experience was unlike anything I’ve ever encountered before. It really felt like I was in the front row, jamming along with the crowd. Later on, I found the guy from the front of the Lounge who unleashed my phone. I took a few Snapchats of the event, but I knew that it wasn’t the same as actually being in the room. Whether Glover does decide to run for the nation’s highest office in the next election cycle (doubtful, but hey, we can all dream too), the next Childish Gambino project will surely be nothing short of a memorable experience. You can watch the live 360-degree performance of “Me and Your Mama” from the new album “Awaken, My Love!” in PHAROS here. The “Awaken, My Love!” vinyl and VR bundle is available in early 2017 through Glassnote Records.